Are you on LinkedIn? Great! 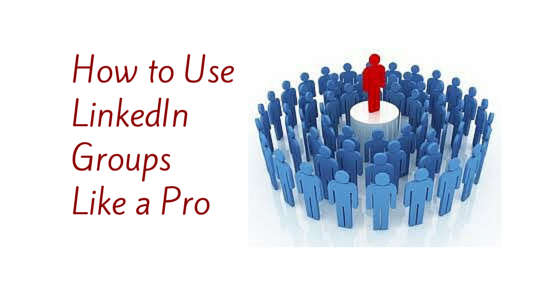 If you are job hunting, looking to build your client base, or simply networking, LinkedIn is the place to be. It is also the place to see and be seen; are you putting your best foot forward with your LinkedIn profile? 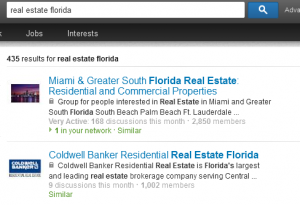 Your LinkedIn profile serves as your page in the networking world – be sure to make the most of it. Aside from filling in the basic requested information – photo, education, job history (you’ve filled those out, right?) there are many other elements that can help you and your page stand out. 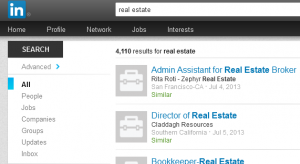 Headline – LinkedIn gives all users an opportunity to sell themselves beyond their job title. One of my LinkedIn connections, Naomi Elbinger, wrote a fabulous blog post on this. Her post inspired me to use the headline space to really promote myself and my business. My headline went from “Director, Virtual Assistant Israel” to “Director, Virtual Assistant Israel – Your #1 Resource for American, College Educated Virtual Assistants”. Which do you think brings me more clients? With the headline, LinkedIn is giving you a free billboard to describe and promote who you are and what you offer; read Naomi’s tips on how to use it to the fullest! 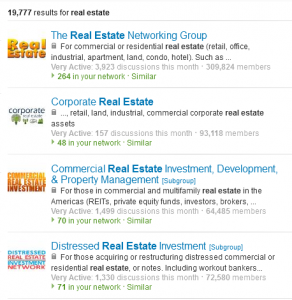 Keywords – What are the keywords associated with your business? Are you a social media strategist, enterprise software entrepreneur, weather forecaster? You know your field well and you know the keywords associated with it. If you don’t (Houston, we have a problem) search for your field on LinkedIn and see how your competitors are selling themselves and what keywords they are using. Alternatively, talk to your SEO resource and find out which keywords you’re optimizing for on your website. Once you have identified the right keywords, use them liberally! They should be in your headline, summary and in the information you provide about your previous positions. Individuals searching for people in your field are likely searching via keywords. Ensure that you appear at the top of the search results by frequently employing your keywords. 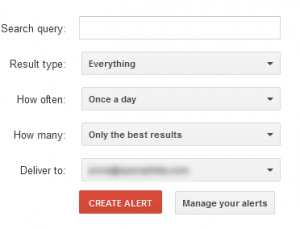 Summary – What is this and why do you need it? Isn’t your whole LinkedIn page a summary of what you do? Yes, it is, but the summary section is an opportunity to frame your experiences to the reader. You have likely held a few jobs in the past, and likely included those in your LinkedIn profile, along with a bullet or two about what you did. But bullets don’t tell the whole story – only you can do that, in the summary. A good summary is illustrative and to the point. Your opening sentence should explain who you are and what you do in a less sales-y way then your headline. Mine is “Experienced business development, strategy and marketing consultant.” The summary should then go on to address your past experience, highlight an accomplishment or two and paint an overall picture for the reader of what you bring to the table. Keep it succinct and light – this is not a cover letter, but rather, your elevator pitch. Experience – Now that you’ve gotten attention (and appeared first in your potential client’s results list) with an eye catching headline and framed experience in your summary, it’s time to highlight some of your key responsibilities and achievements in the experience section. Do not copy and paste your resume. Rather, select the best of the best from each of your prior positions. Use bullets to make things clear and brief. Three bullets per position is ideal, anything more than 5 is overkill. You want to highlight your skills and experience while keeping the reader engaged and his eye moving around the page. If you make things too dense he will likely close the page before adding you as a connection. Include just enough to make it interesting, and hopefully he will click that connect button, effectively reaching out to you to learn more! Recommendations – How better to showcase your skills and ability to work well with others than a top notch recommendation? If you don’t have any recommendations, apply the knowledge you learned in pre-school: “The best way to get, is to give!” Write some unprompted recommendations for current and former colleagues. Not only will you make their day, but you will have an opening to ask them to return the favor. 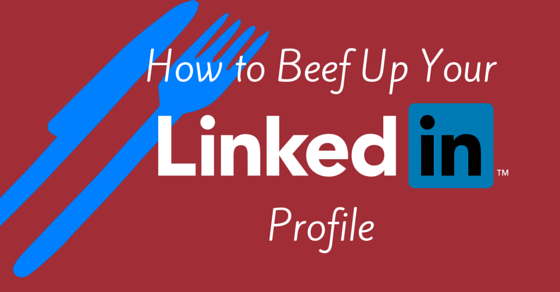 Now that your profile is fully enhanced, connect with me on LinkedIn so I can check it out. Happy networking! Social Media Marketing: Don’t Be Scared! When considering how to use Social Media, forget about everything you have ever read about Social Media, and just think conversation. Social Media is one of the fastest growing marketing tools on Earth and it is changing the way people connect with their friends, family, customers, and the world around them. It’s made up of text, photos, images, video and other sorts of information that people create, and post on the Internet through social networks, blogs, and websites. 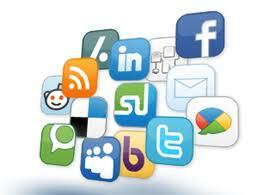 These sites allow users a place to share content publicly, or with a specific list/group of people. Not all businesses are on all platforms, nor should they be. The top social networking platforms today are Facebook, Twitter, YouTube, and LinkedIn. Every business has different needs, and a specific target audience. The first step when getting started is figuring out where your target audience is. When I first begin my relationship with a new client, we immediately discuss goals, ideal new customer profiles, and expectations. This helps pinpoint the audience to be engaged, and also allows me to bring to the forefront what social media is for, and what it is not for. It is about being present and genuine. It is about (really) listening and staying connected to your audience. Social Media is not the place for hard sales. It is not about being EVERYWHERE. You’re going to “Go It Alone” – How? Set aside time for research. Begin with the basics. Make it a part of your daily work plan, and schedule it, like a meeting, with a beginning and end time. Begin educating yourself with the multitude of resources available online, for free. TechCrunch, Mashable, and the Social Media Examiner are great places to get started. #2: Make it your routine to listen, listen, listen then engage. How does listening via social media differ from listening to your friend, your boss, your spouse? It doesn’t. Or at least it shouldn’t, unless of course, you’re that guy who’s always just waiting for the other guy to finish so he can speak. If you are going to enter in to a “conversation” you need to first take the time to listen to what’s being said. Listen to what your customers, competitors and other voices in the industry have to say. This can help you see where your place would be to enter the conversation. 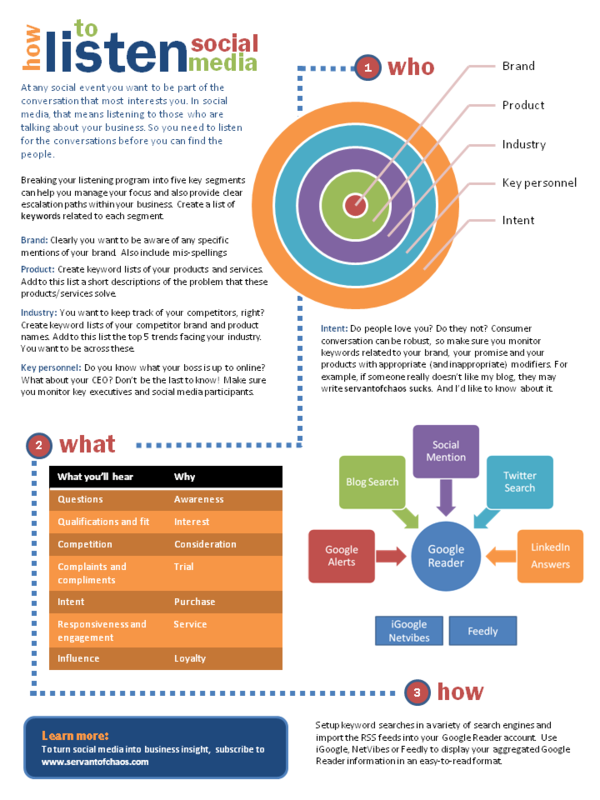 Ok, Social Media newbies, our new word of the day: Infographic. An infographic is what we all used to call a picture or image, but it’s a new kind of picture crammed full of information that is easier to see than explain via text. It’s one of many social media elements you will start to become familiar with as you continue to dive in to the industry. Please check out the infographic below to get more clued in on Social Media listening. #3: Remember that customers don’t want to only hear about promotions. Don’t tweet: “Buy my product.” Your customers (and potential customers) want to be talked with and cared about. Your content should make consumers feel valued and involved in the company’s culture. Engage with your target audience as a friend. Overwhelming? It can be at first, but that’s no different that anything else you would try, learn, study, practice, and master. Infographic credited to Gavin Heaton of www.servantofchaos.com. The original is downloadable on SlideShare.